Learn the proper grip to lower your golf scores. A golfer's grip must align the face of the club with the desired line of the shot while keeping the club head from rotating at the point of impact. This requires the correct grip position and just the right amount of pressure to hold the club steady without tensing up the arm muscles. When you are practicing, stop after your shot to check the position of the your hands on the club to make sure they are in approximately the same place as when you started the backswing. Use your dominant hand to loosely hold the club in front of you with the head on the ground. Allow your non-dominant arm to hang down from the shoulder in a straight line. Wrap your non-dominant hand around the top of the grip so the club shaft rests against the base of your index finger. The shaft should cut across your palm diagonally from the base of your thumb to your wrist. Wrap your dominant hand around the bottom of the grip so the pinky finger fits between the index and middle fingers of your other hand. Align your palm with the line of your shot to keep the club face on target during the swing. Check your grip by placing a piece of grass between the top of the thumb on your non-dominant hand and the base of the thumb on your dominant hand. 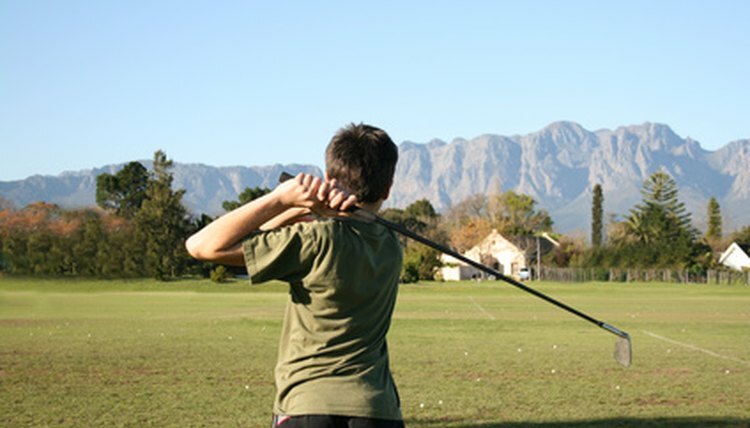 If the grass is not there after you hit a practice shot, your hands are sliding apart during the swing. Gripping the club too tight causes your muscles to tense up, which limits the range of your swing and may even lead to injury. Set up in your stance and look at your thumbnails to see if you are applying too much pressure to the grip. Loosen your grip if you see white under your nails instead of your normal skin color. Visualize a tube of toothpaste with no cap to help you keep a light touch on the grip. If you squeeze the tube too hard, the toothpaste will squirt out of the open end. The same grip position may not be ideal for every type of shot you will encounter on the golf course. Slide your grip toward the end of the club to increase the distance when hitting a drive or long fairway approach. When chipping, move your hands closer to the club head for better control. Sliding your grip down can also help you keep the club head from rotating when it contacts the tall grass on shots from the rough. For even more control, move your hands closer together so the thumb on your non-dominant hand slips under your dominant hand. Denise Sullivan has been writing professionally for more than five years after a long career in business. She has been published on Yahoo! Voices and other publications. Her areas of expertise are business, law, gaming, home renovations, gardening, sports and exercise. What Golf Grip Should I Use? How Do I Hold a Belly Putter?